General Description: Welcome to the White Waters in Machico. 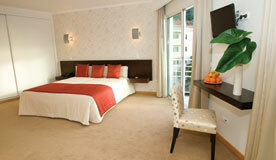 The closest city to the hotel is Funchal City (25 km). To make your stay more comfortable air conditioning, a lobby, a kiosk, a reception and a conference room are available. The staff in this 2 storey hotel speaks German, English and French. Distance from the hotel to: airport FNC (7 km). The hotel is within easy reach of bus stops. Amenities: Reception hours: 24h Service. Meals: Breakfast it is provided from 07:30 - 10:00 in the following variations: Continental, Buffet. Guests are welcome to enjoy their meals at the restaurant. Sport and Leisure: A variety of activities are provided by the hotel such as table tennis. Guests who wish to be active on holiday can enjoy activities such as tennis. The nearest golf course is 10 km away. Additional Information: The following payments are accepted: Visa Card, Euro/Master Card, American Express and Diners Club.